When my father died 3 years ago, my comments at his funeral noted that the greatest aspiration any of us can have is to make a difference in the world. My father’s life made a difference. I’m always self-critical in analyzing my own life. I moved to Boston 20 years ago this month. In those 20 years of service to BIDMC, Harvard, numerous federal organizations, international governments, and the industry, I’m hopeful that I’ve laid a foundation for 20 more years of trying to make a difference. It’s hard to forecast the best path to have an impact on the healthcare ecosystem, but I can try. The past 5 years belonged to government — with $34 billion spent on healthcare IT as a result of HITECH, the Meaningful Use program accomplished the goal of moving clinician practices and hospitals from paper to digital systems. Although many challenges remain — improving workflow, enhancing quality/safety, and ensuring usability — the basic platform on which we can build future innovation has been created. The government will continue to be a very important actor, especially CMS, in setting payment policy that will impact the behavior of all stakeholders. However, I believe the era of prescriptive government direction of the IT agenda has ended. Provider organizations are begging for an outcomes focus, instead of a process focus. Where will the next innovations come from? How about the large incumbent HIT vendors? Despite rumors to the contrary, our major healthcare IT vendors are well meaning and not spending their time information blocking. They are devoting their resources to creating software which adheres to the thousands of pages of regulations introduced over the past few years. One major vendor noted that their programming staff is already booked for the next 32 months just to ensure compliance with existing regulations. The small amount of free bandwidth that incumbent vendors had reserved for innovation has been co-opted by regulation. How about startups or high tech companies that have a startup mindset? Startups, such as those making population health/care management, decision support, and consumer facing apps, likely have more time to focus on innovation than incumbent EHR vendors maintaining certified EHRs. Many of these startups lack domain expertise in healthcare processes, so they may not produce the products and services the marketplace really needs. However, that’s ok, since out of many failures often comes one great success. I think we need to watch companies like Apple, Google, Amazon, Facebook, and Salesforce for important healthcare innovations. How about provider organizations? Some academic healthcare systems have dedicated innovation resources and they will continue to lead important work. However, provider organizations are faced with the compliance/enforcement side of the same regulatory expansion that is consuming the incumbent vendors. Most provider organizations will devote 100 percent of their IT resources to operations and compliance. So, it’s an edgy prediction, but I believe the next 5 years of healthcare IT innovation will belong to the private sector, to companies we’ve not yet heard of and companies outside the usual healthcare IT mainstream. 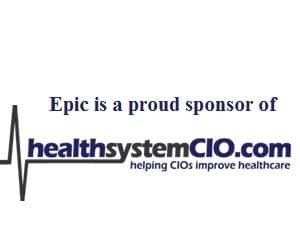 The incumbent vendors may be able to crowdsource and leverage the resources of these innovators, as athenahealth will do with the More Disruption Please program and Epic will do with its app store. At BIDMC, we’ve launched our own crowdsourcing program, and we’re increasingly dedicating resources to innovation. We’ll continue our collaboration with numerous private sector companies, serving as a learning lab to test new ideas. In my next 20 years, I hope to oversee innovative work on social networking communication applications, patient-facing mobile applications, population health analytics with workflow tools, and cloud-based healthcare IT services. I turned 54 this month. I’m hoping at 74 that I can reflect on 40 years in New England and say that my efforts have made a difference.